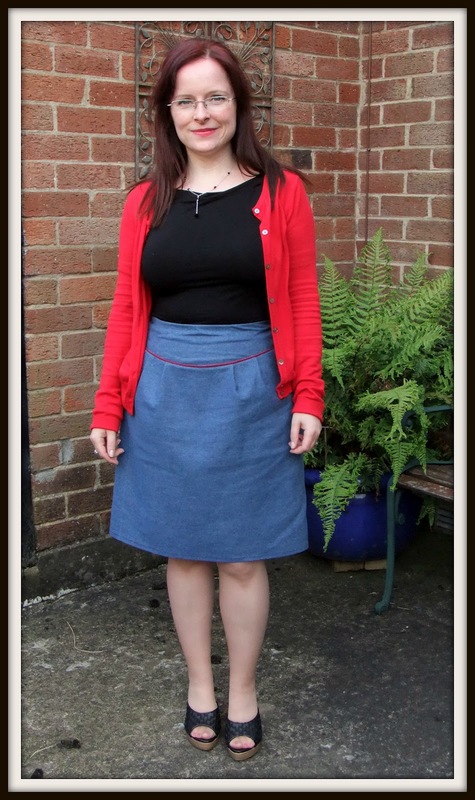 I have seen so many lovely versions of this skirt on the internet, but I talked myself out of buying this pattern for ages because I thought it was too similar to Simplicity 2117, but I'm glad I gave in! 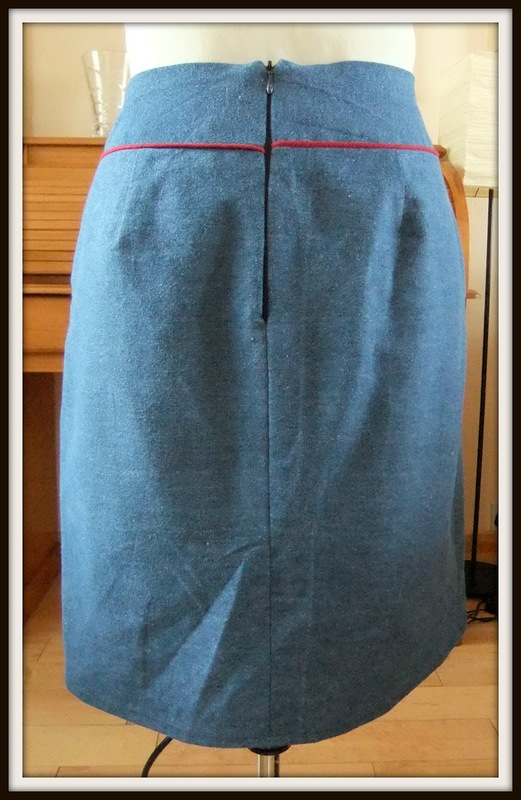 I went with View D, and as you can see I added some piping to the waist and the top of the pockets. This was my first go at piping, and it was really easy. It worked perfectly first time! This isn't a great photo, but it shows the piping quite well. 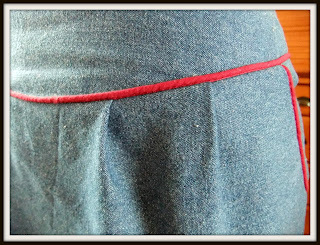 If you're wondering why the piping isn't continuous at the side seam, it's because I had to unpick the side seams because it was too big! :( Simplicity 2117 fitted me perfectly at the waist, so, as this is also a Simplicity pattern, I just went with the same size. 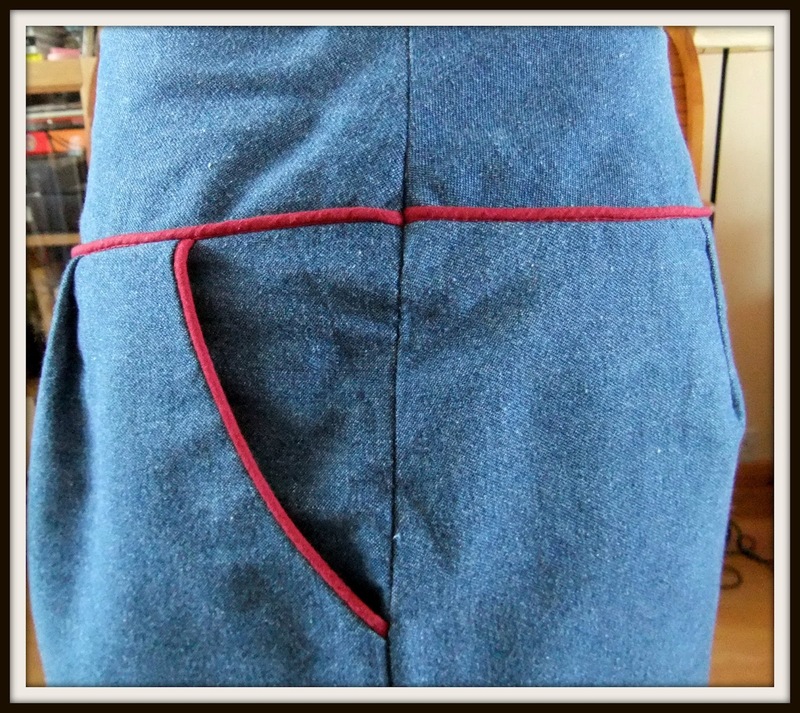 I made the pockets, sewed up the side seams and put in the zip then tried it on. It was huge! I ended up taking it in by 1 inch at each side. This meant I lost 1/2 inch off the bottom of the pocket opening. It's just as well I have small hands! 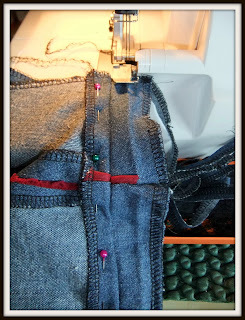 And unpicking denim was not fun, especially as I had to re-do the ends of the piping. But I did discover a new gadget. It's this little metal thingy in the photo below. It has a magnet on the bottom of it and it was in among my Granny's sewing stuff. Turns out it's a seam allowance guide. 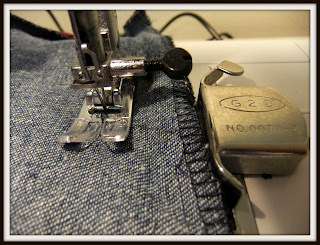 You magnetize it to the foot plate at whatever distance you want your seam to be, and guide the fabric along it as you sew. I've found it very useful. 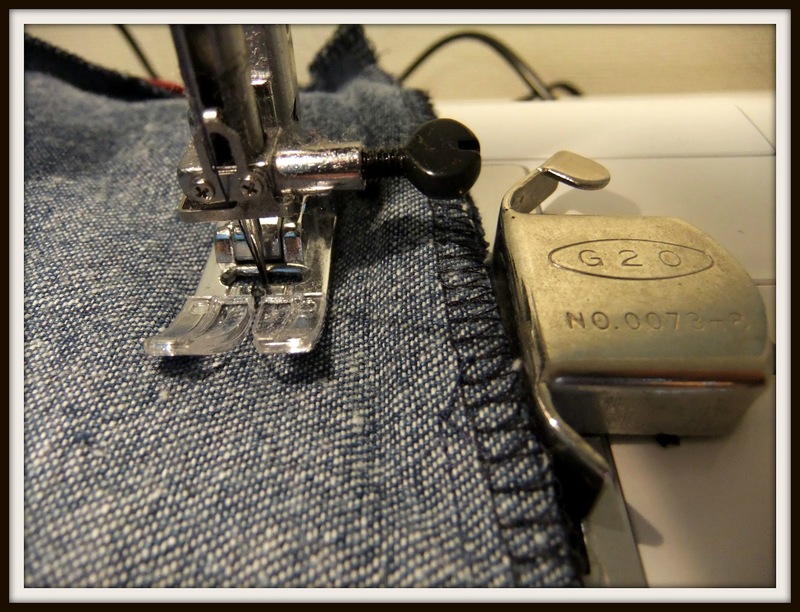 Another thing I learnt was that when you're overlocking your seams, pin fabric you don't want to overlock with the pins facing towards you as you sew - as in the photo below. I was cutting off the excess seam allowance after I had taken it in, and had pinned it with the pins facing the other way. 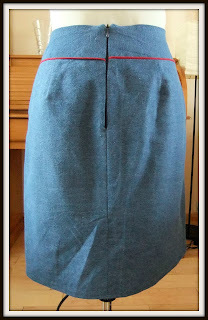 As I was feeding it through the overlocker, I managed to catch the top of my finger on a pin. Then I learnt that it's tricky to hold a tissue around your bleeding finger whilst pinning without getting blood on your fabric!! 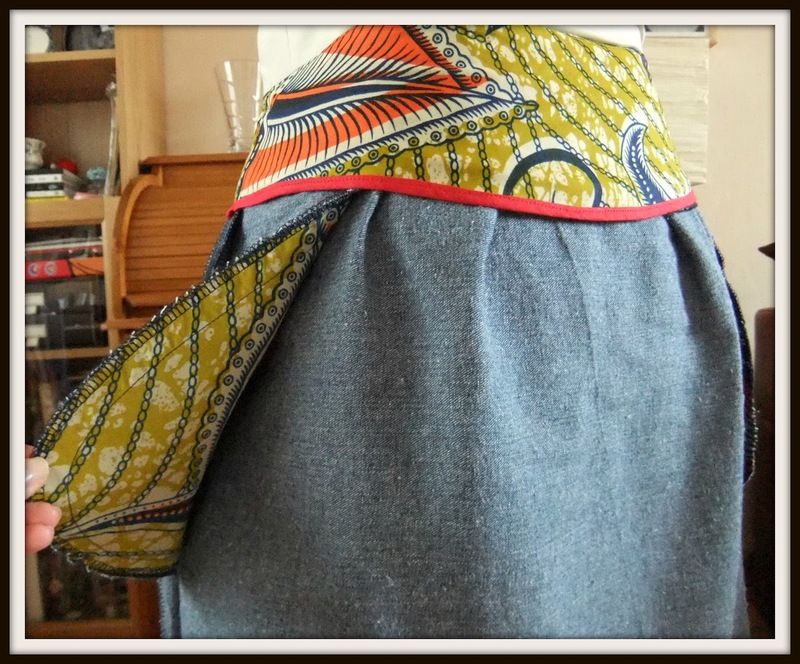 I used some African Wax Fabric for the facings. This fabric is a bit of a revelation for me. I only read about it recently on a blog, and ordered metre on ebay to see what it was like. When I got it, it was very stiff, but it softened up considerably in the wash. I added some red bias tape to the bottom of the waistband facing just to make it look nice! Here's the inside of a pocket, I really like how they look. All in all, a successful make, if a bit frustrating with all that unpicking. I have also made some progress with my Aeonium beret. I'm a bit further on than in this photo, but I ended up tinking the same row twice yesterday. Then when I finally got it right, I found a problem in the row below. 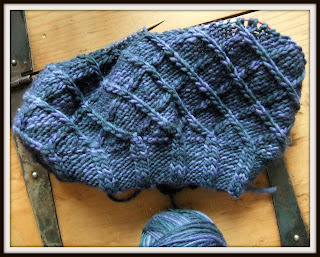 That was when it went back into the knitting bag! So I think I'll have a look at it now. Hi Lynne, I love your new skirt the red pipping really sets off the denim. 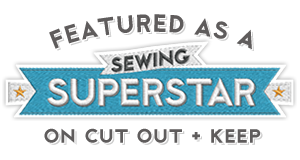 I remember reading about embroidery or was it quilting? It's seen as good luck if you prick your finger and bleed onto the fabric. It's quilting but can't remember where I read it. Hope you have a lovely week. Love all the contrasting lining and bias tapes. I live right near a market that sells loads of this fabric, but I've never thought of using it like this. Thank you! 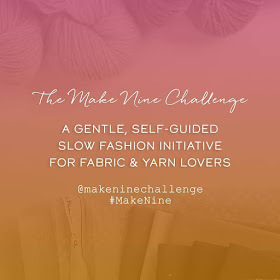 I am very jealous of you living near a fabric market, there's nothing like that where I live. Really nice, the piping is a great touch and love the wax fabric. I've got this pattern too, really must get round to making it. Thank you! It's an easy enough make, and I intend to make another one. Thank you! I'm going to remember this when I'm trying to fit the back of a top - it's not going well! Another great piece of sewing. That piping is fabulous. I'd love to make some cushions with piping for my sofa! Thank you! I should have mentioned that even though the piping was easy, I had to get a piping foot for my machine. Looks like the hat will be a perfect match! Thank you, I hadn't thought of that!! Wow! You have been busy! 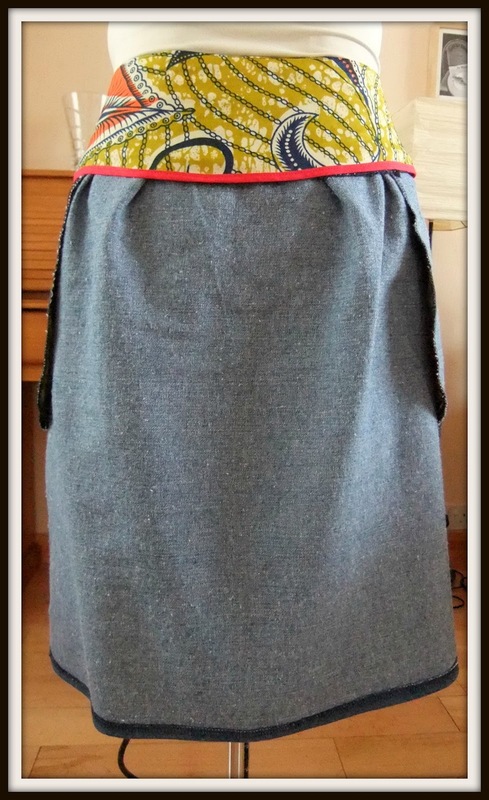 Such a lovely skirt and a flattering fit! 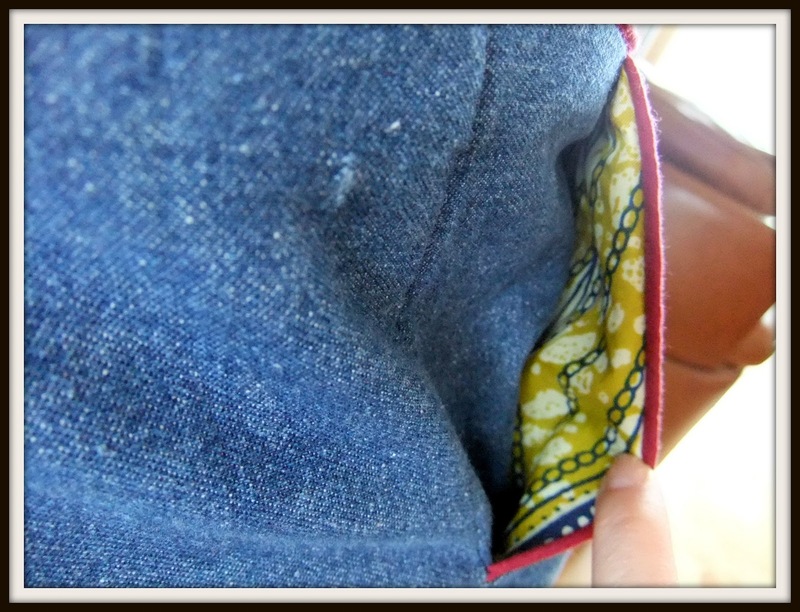 I love all the hidden fabric facings on the inside, although it seems a shame to hide them?! This skirt is really cute. 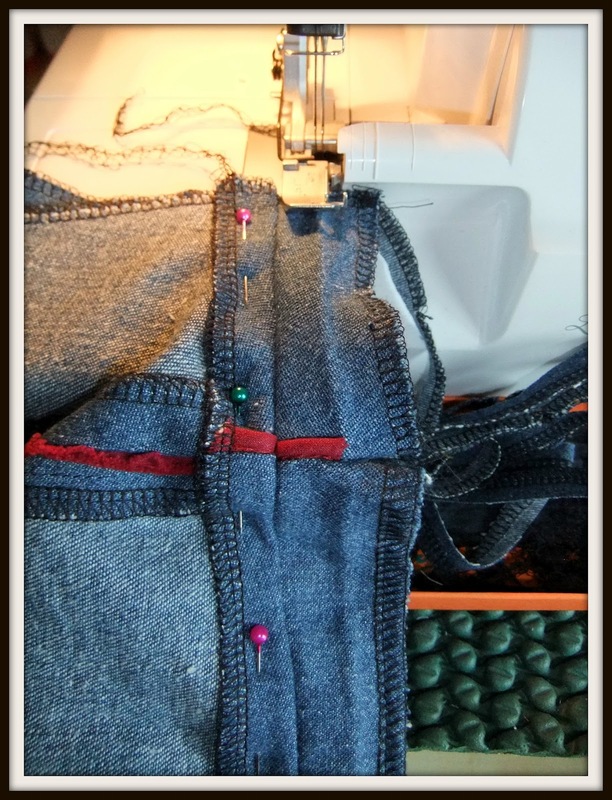 Love the red piping and it sounds like your magnetized seam allowance foot was a great find! Gorgeous skirt! The red piping really makes it something special!